and a teaser :) for anybody wanting one! For Those Of You Who Like Slow Blues!!! Keep practicing. Those double stroke rolls can really pay off one day! help us build our fanbase and we''ll help you build yours! 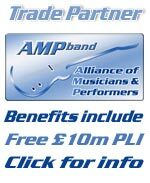 shameless plug for a fantastic music site. Why are some songs out of kilta. Quick Gig Review! - PLEASE READ THIS if you have time? a runner has been done!